How can Markov State Models be used for ligand-protein complex Molecular Dynamics simulations? Question: How can Markov State Models be used for ligand-protein complex Molecular Dynamics simulations? I am a novice structural bioinformaticist using Schrodinger Desmond, and I have used MD for ligand-protein complex Molecular Dynamics simulations. While my methods are pretty traditional, I have found that in http://folding.stanford.edu/dig-deeper/ Folding@home uses Markov State Models for folding. Since Markov State Models can produce similar results for a multi-microsecond simulation with multiple nanosecond simulations, how can people use them for ligand-protein complexes? 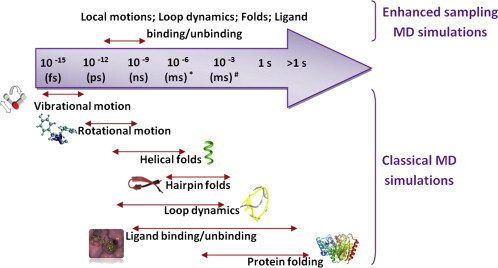 As seen in this image, ligand binding time may take as much time as folding. In this case, are there any tools or applications that can be used easily like traditional MD toolkits like GROMACs or DESMOND? Are there any resources about this? How to choose the best structure from the trajectory file after doing a Molecular dynamics simulation of 30ns or any for particular time interval? How Much Time Is Required For 1 Nanosecond Md Simulation.